Last week there was a high spring tide. We would have known, had we actually looked in the tide tables that we both have, which might have been sensible especially with Lucy’s balance just nearly restored. But we hadn’t, and for a while we swam in a hypothetical Clevedon Marine lake, or rather, we swam a couple of feet above the lake, until normality was restored. NEW: If you like my drawings, you might like to know I’ve just put next year’s calendars up in my Etsy shop – more on this in the next post…. 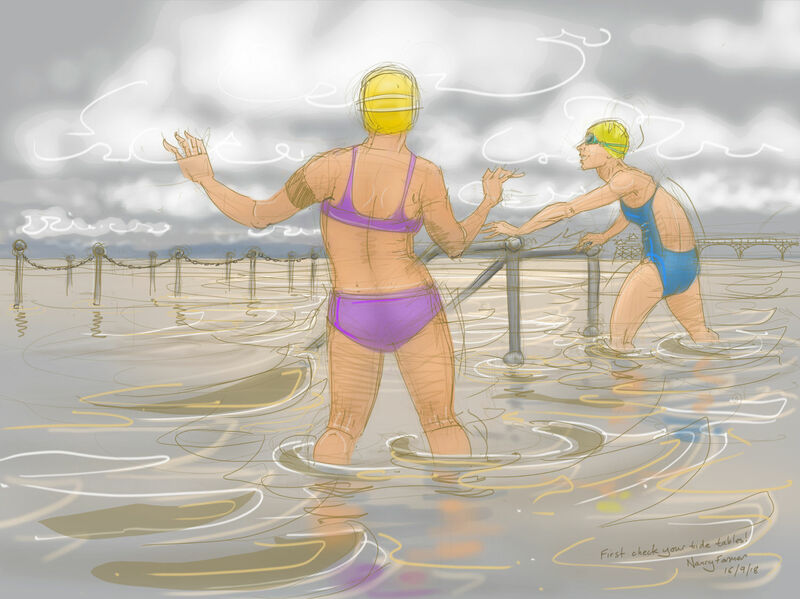 This entry was posted in digital, swimming and tagged art, calendar 2019, Clevedon Marine Lake, drawing, high tide, Nancy Farmer, open water swomming, spring tide on September 19, 2018 by Nancy Farmer.